When May rolls around next year, John Maine will be 29 years old. That said, you can no longer look at him as a young pitcher on the rise. In fact, the opposite is true; in many ways, Maine has gone backward since 2006. His ERA has increased from 3.60 to 3.91 to 4.18 to 4.43. His walks per nine innings have risen from 3.3 in 2006 to 4.2 this past season. Hits per nine innings went from 6.9 to 7.4 (7.8 in 2008). Strikeouts per nine innings have dropped from 7.1 in ’06 and 8.5 in ’07 to 6.1. He has suffered a shoulder injury that required surgery, and has yet to prove he has recovered 100% — with a related drop in velocity from 95-96 MPH to 91-92. Even before the injury, Maine was regressing — though, that could have been due to the injury itself. Despite a 15-win season in 2007, Maine never really had strong command of his fastball, his breaking pitches were inconsistent, and his change-up was below average. What Maine had going for him was a 96-MPH rising fastball that many undisciplined hitters could not lay off of. If that velocity doesn’t return, what does Maine have going for him? As mentioned many times on this blog, Maine’s mechanics prevent him from consistent command of his pitches. 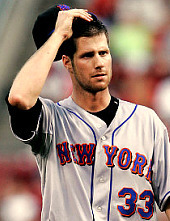 Let me be clear on one point: John Maine is one of my favorite Mets. I absolutely love his cool and fearless demeanor on the mound. I want very badly for John Maine to succeed. But I won’t let that emotional tie to cloud my judgment — which is the fact that Maine is a huge question mark, even if healthy. Despite his questionable health and command issues, the Mets have little choice other than to keep Maine around for 2010. He’ll be due a raise through the arbitration process, but as long as there is a dearth of pitching at all levels of the organization, the Mets can’t afford not to hope for a rebound by John Maine. Even without his velocity, he showed enough in 2009 to prove he could be a solid #4 or #5 MLB starter — and that’s nothing to sneeze at. With a little luck, and a little improvement, he might be able to elevate himself into the stratosphere he floated in 2007. But counting on that optimism is irresponsible; better to pencil him in for the back end of the rotation, and be pleasantly surprised if he exceeds expectations. If you look objectively at Maine you have to cut him. He lost his fastball and is only a 4 inning pitcher. I can see signing Maine as a long releaver and cutting Dessdens. The Mets are going to talk about signing Lackey, or Halliday but they should sign Marquis, and Wolf and/or another pitcher of that caliber. Then if Perez is still a bust next year you have a pitching staff. If you have Santana and Pelfrey and three mediocre pitchers again how far will you go? I think Maine showed in september he could still get major league hitters out. I would give him one more year. joe; Unless you’ve seen medical reports that state Maine’s shoulder was at 100% strength you don’t have any idea if he’s lost his fast ball or not. I agree Mr Sadecki, with the shallowness of the Mets ready for the big league arms, and the unknown of being able to get any pitcher as an FA, Maine should be brought back for 10. If you look at the Mets pitching next year they have Santana, Pelfrey, Niese, potluck Perez and a guy that was hurt the last 2 years and Nieve. Perez is unreliable at best and showed he gives up 5 or 6 starts a year where he don’t pitch out of the 4th inning. Maine would probably be a good long man because the last 2 years hitters had a .300 average the 3rd time up against him. Instead of learning from last year the GM Jeff Wilpon will continue to field 6 stars and the rest a AAA team. Maine is shot. No more question marks. We are stuck with Ollie, there is no reason to be stuck with Maine. Not only is Maine a 5 inning pitcher, his losses of focus can occur at any time. He might be useful as a cheap long reliever but nothing else. This team has to stop crossing its fingers and hoping, and start managing itself in a professional fashion. jdon, how can you say a 29 yr old pitcher is shot? Maybe i just love him because he has a rising fastball like seaver did.